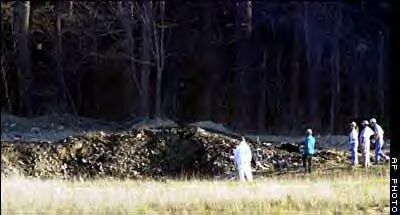 Emergency workers look at the crater created when United Airlines Flight 93 crashed near Shanksville, Pennsylvania, on Tuesday. Radar showed the Boeing 757, bound for San Francisco, California, from Newark, New Jersey, had nearly reached Cleveland when it made a sharp left turn and headed back toward Pennsylvania, crashing in a grassy field edged by woods about 80 miles southeast of Pittsburgh. There were no survivors. The plane, which took off from Newark bound for Los Angeles, was near Cleveland, flying at 35,000 feet.